Nov 29th update: A very nice Les Paul 30th Anniversary - The war-time L-50 is on line. See the updates in the collection section. Fine electric archtop with pointed single cutaway. Exceptionally fine conditions for a 40 year-old instrument, really "near mint". Only visible sign of time: light "stress" finish cracks in the neck-joint area, which by the way is perfectly stable and structurally solid with no issues at all. No touch-ups, no heavy dings, no checking. Laminated maple body, rosewood bridge and pearl-block inlaid fingerboard, original Grover Sta-Tites, chesterfield headstock inlay. This model was conceived as a reply to the ES 175, but its early Guild humbuckers give a strong and distinctive personality. Great jazz and blues guitar, all original including the frets. Non original hardshell case, solid and almost new. Ain't she pretty? Another great '50s Stratocaster with all the early features, 100% original and with a killer sound. Figured ash body, two-tone sunburst finish, maple neck and bakelite parts. The body is dated March 1956, has a very deep contour which makes it light and comfortable. The original finish has lots of checking and wear on both sides, showing the beautiful figure in the wood. The neck, dated May '56, still has the "clubby" pre-V shape typical of '55; it has some wear and original nut and frets. The Spaghetti logo on the headstock is in great shape, and next to the original round string-retainer there is another hole, professionally plugged and touched-up, from some mysterious "thing" once screwed to the headstock; whatever it was, it's out of the strings line, in a position which makes meaningless another string-retainer, so I have no explaination for it. The original tuners are still stamped Pat. Appld. but, compared to the '55 "no-lines" they have again the single-line stamped Kluson Deluxe words. All original hardware. The black-bottom pickups fixed to the single-ply pickguard have the original bakelite covers, two of which are broken from playing wear. Also the tone and volume knobs and the trem-arm and switch tips are made of bakelite. The original circuitry shows potentiometers date February '56, paper capacitor, intact solder-joints, three way CRL selector switch and Switchcraft jack-socket. The fingerboard shows some wear, but the frets are still in decent condition with lots of room for bending and a nice and easy action. The sound is great, hot and well-balanced, with the right amount of grit you'll expect from a '50s maple-neck Strat. This exceptional guitar comes with its beautiful tweed hardshell case, strong and original, with all of its latches and hinges perfectly working. This guitar in back in our collection, after leaving in 2003. We have 53 new pictures online, but the old ones can still be seen HERE. Another wonderful Pre-CBS Strat, with an incredible flamed maple neck with brazilian rosewood board and clay dots. Perfect Spaghetti logo, small headstock with a very beautiful figured wood, Kluson Deluxe "double line" tuners, "L" serial number. Neck date is September 1964, pots date is 28th week of '64. This guitar, besides its striking beauty and great sound, has some transitional peculiarities: its three pickups are all dated Oct 15th '64, but one is an old-style black-bottom with yellow stamped date, the middle one is an early grey-bottom with the same yellow stamp (and that's the first time I see a grey-bottom pickup with the yellow stamped date), and the third one is a grey-bottom with the same date, but penciled instead... a perfect transition from black-bottom to grey. Another almost-transitional feature is the pickguard, one of the earliest white guards introduced in late '64, instead of the green one more commonly associated with Spaghetti Logo and clay dots. This white plastic guard is surely original and a bit warped but still in good shape, with the usual crack next to the neck pickup screws. All the other plastic parts are also original and in good shape. Gorgeous sunburst finish in excellent condition, just some belt-buckle wear and fading of the red beneath the right arm, and a few scratches and dings on the body edges (all shown in pictures), but I'd conservatively rate this guitar's condition as an Excellent plus. All the hardware is original, with some rust on the bridge saddles. The Klusons are in excellent working order and look great, no hidden flaws or holes whatsoever. Probably the guitar has been refretted and the nut has been replaced. The three-way switch currently installed is new (but with the old original tip), but the original one is in the case, it's broken and I don't know if it can be fixed - but I think it's not impossible. Everything else is 100% original, including pots, screws, knobs, tremolo arm, bridge and saddles, spring-cover on the back. The body is made of light alder, deeply contoured. The flamed neck makes this old Strat really special. Not only it looks great, but it also has easy action and playability and a very comfortable profile. All the pickups work great and the guitar has the sound that gives pre-CBS Strats their legendary status. Original Fender case in black tolex, correct for the year but probably made for a Jazzmaster (it's slightly larger and with a square-sized pocket). Black finish, 100% original. Neck date October 72, pots date 46th week of '71, grey bottom 'staggered' pickups dated 1972 (2312). Light alder body, three-bolt and 'tilt-neck adjustment' maple neck, large headstock with black logo. Black is one of the most sought-after custom colors, since Jimi Hendrix often used black Strats with large headstocks. The finish is original and in good conditions, with some checking and heavy wear on the back, which goes down to the wood. The body front is very clean. The wear-pattern and a small additional plugged hole from another strap-button on the lower horn, reveal that the previous owner was left-handed and used the guitar upside-down, à la Hendrix. All the parts are original: bridge, tuners, circuitry, staggered-pole pickups, potentiometers, three-way selector switch, plastic parts, etc. Custom color's rarity, light weight and sound make of this guitar a winner. Excellent action, smooth and easy maple fretboard with frets in good condition. Pickups have a loud output and are well balanced, and give the guitar a hot and clear sound. Bridge and spring covers are missing. The guitar comes with its original black tolex hardshell case with Fender logo. Sunburst. A super clean example of a late-70s Stratocaster in exceptionally fine conditions. Figured-ash body with brown sunburst finish and maple neck with rosewood fingerboard (and skunk-stripe on the back). Black plastic parts, typical of the period. The guitar is completely original. It has a 1979 serial number and the grey-bottom pickups are dated 1979 and 1980, so the instrument must have been shipped early in 1980. No other date is visible, neither on the neck base (the stamp has faded and can't be read anymore) nor on the potentiometers (the date is hidden by the solder-joints). This Strat has all-original hardware and circuitry features, with three-bolts neckplate, tilt-neck adjustment, "F" tuners, truss-rod "bullet" on the front of the headstock, etc. Very nice look, the body has a beautiful finish and wood-grain. The weight is acceptable if compared to other ash-bodied Strats from the same era. Everythings works fine. Smooth action, frets and fretboard are in excellent shape. The guitar comes with its original hardshell case, which in perfect conditions as well. Another great Fullerton-era Stratocaster, in perfect and all-original conditions, in one of the rarest and most sought-after custom finishes: Lake Placid Blue. This 62-style reissue has a very nice rosewood board over a lightly figured maple-neck. Neck date is Jan 27th 1983 and pots are dated 26th week of '82. So it comes from the early months of the second year of production and has all the most desirable features. The guitar is exceptionally light, thanks to a very deep and accurately shaped contour, one of the features that have made these instruments gain the "legend" status among collectors and players alike. We'll let the pictures speak: each and every detail is shown in the 62 dedicated photos: the black-bottom pickups, the body routings, the electric circuitry and parts, the three-spoke knobs, the bridge with "Fender"-stamped saddles, the Kluson-style tuners. The Lake Placid Blue finish is in exceptionally fine conditions, unfaded, the only flaw being a tiny nick on the top, less than one millimeter wide. Very nice neck-feel and low action, frets are almost new and sound is great. This super clean Fullerton Strat comes with its original tweed hardshell case, a little worn on the top, complete with its key. The guitar still has all its covers, vibrato arm and even the original Fullerton, California instruction manual. The "Fullerton" collectors and players will love this one: a very clean and all-original example of an early '82 Fullerton-Tele, complete with ALL the accessories and papers, just like the day the guitar first left the shop in Turin, Italy, where it was originally sold over thirty years ago. The figured-ash body is finished in the classic "butterscotch" color, which shows only minimal traces of wear, mostly on the back. The neck is made of solid maple and has original frets and nut with almost no wear. Not too heavy, great sound and easy action. The guitar comes from the earliest Fullerton era: it has a very low serial number, neck is dated 1982 but month is not clearly readable, pots are dated 31st week of 1981 and the Certificate of Authenticity signed by former Fender's CEO William C. Schultz reports April 14th 1982 as official production date. Everything is 100% original: even the electric circuitry is still factory-wired in the old '50s style, but in the original tweed hardsell case case you'll find the mod-kit with both the potentiometer and the capacitor for the conversion to a more familiar '60s scheme. Among the other papers and case candys, you'll find also the optional 6-saddle bridge offered as a replacement for the old-style 3-saddle unit, the warranty card, the case keys and the hex-keys for the guitar's adjustments... and even the original jack cable! It's really rare to find such guitars complete with all this stuff. A great find, an affordable Tele for the real musician and discerning collector, a solid investment and a terrific player. Blond. Very nice mid-60s typical transitional Telecaster: Excellent condition, all original, with an exceptionally fine Brazilian Rosewood fretboard. Transition Logo shows some wear but is clean enough. Original Kluson Deluxe "double-line" tuners, pearl dots. Neck date is July 1966, pots date is 42nd week of 1965. All original pickups and electronics, bridge pickup has its pencilled date hidden by the usual masking tape but is untouched and clearly original (we have completely disassembled it looking for the written date, as you can see from the pictures). Typical mid-late '60s wiring, with volume and tone controls always working, both in individual and double pickup selections, and you can see the small .001 MFD capacitor at the volume pot. All original hardware: bridge with threaded saddles, Kluson tuners, knobs, nut, daka-ware switch tip, pickguard, etc. The fingerboard is made of exceptionally beautiful Brazilian rosewood and is in excellent shape. Normal playing wear, mostly on body edges and back of neck, no belt-buckle wear, some light checking, heavier on the headstock . A few dings on the lower body edge go down to the wood. On the headstock there is a small plugged-hole from a second string retainer, now removed and touched-up. It's the only real flaw of this exceptional guitar and we have tried to show this in detail in the pictures below. Great sounding, great-playing problem-free Telecaster, in really very fine conditions. The neck is straight and the frets are ok. Loud and aggressive sound. The guitar comes with its very clean original hardshell case, covered with black-tolex and with the '66-style "no-underline" Fender logo. Sunburst, a typical Jazzmaster from the transitional era which goes from late '65 to early 1966: all these Jazzmasters - and Jaguars - have the unique combination of a dot-inlaid fingerboard with a white plastic binding. Until then, all the fretboards were unbound, and after mid-66 the dots were replaced by large blocks. This nice guitar is 100% original. The neck is dated October 1965 and the pots are dated '64 and '65. The serial number on the " F" neckplate could be either late 1965 or early '66, but every detail indicates the first as more reliable dating. The guitar's peculiar circuitry has a slide- switch on the upper horn, which can select either the standard controls (master tone and volume) or a preset warmer "rhythm" sound with two thumbwheel controls for tone and volume. The pickups are the classic large and flat single-coils. Not a single screw has ever been changed. Not a single solder-joint has ever been touched. The chrome hardware consists of the typical Jaguar/ Jazzmaster floating tremolo with original vibrato arm, the original bridge with threaded metal saddles with metal cover, original Kluson Deluxe "double-line" tuners. No modification whatsoever, no hidden nor visible holes. The asymmetrical body is made of light alder, the bound neck is made of maple and has a beautiful brazilian rosewood fretboard with pearl dots, the pickguard is made of multy-ply tortoise plastic. The nice sunburst finish is in great shape, with some fading to the red due to the exposure to sunlight, as shown by the comparison with the areas hidden by the pickguard and with another area covered by a sticker (now removed) whose shape can still be seen just for the absence of fading of the red in the three-tone sunburst color. There is some belt-buckle wear on the back, but all in all the guitar is in really excellent conditions. The fretboard is one of the last made of Brazilian rosewood, whose exquisite grain adds a classy touch. Frets, neck angle and action are ok, thanks also to the two original paper shims, so common in '60s Fenders neck pockets! The guitar sounds great, loud and powerful, especially in the standard circuitry setting. The case is the original hardhell covered with black tolex, still '65 without the Fender logo, with some trace of wear but still strong and solid. We are very proud to offer this beautiful and very rare pre-CBS custom-color Fender Jaguar, 100% original, built between late 1963 and early '64. Potentiometers are dated 48th week of '63, neck is dated January 1964, "L" serial number. An exceptional guitar, made even more precious by an original see-through blond finish over a nicely-grained ash body. Maple neck, beautiful brazilian rosewood fretboard with clay-dots. The nitrate tortoise pickguard is intact and perfectly matches the body's finish, for one of the most classic and beloved looks in Fender's aesthetics. The tuners are the original Kluson Deluxe "single-line" units and work fine. The bridge is complete with the Fender mute and the chrome-plated cover, the floating-tremolo still has its original arm. The electric circuitry is untouched and all the solder-joints at pots, pickups, jack and switches are intact. A clean and original guitar: it has only been refretted and a new nut has been installed, in order to restore the guitar's perfect playability. A very professional job with correct specs and materials, and this is the only work ever done on the guitar during its long life. The body shows moderate playing wear and there's a very small ding on the neck, but the overall conditions are really excellent. Everything works as it's supposed to do, the guitar is a joy to play and sounds great. 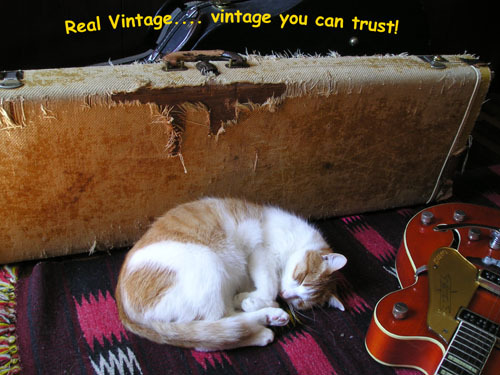 It comes with its gorgeous original brown-tolex hardshell case, rarely seen with a Jaguar from late '63 when the most common match was the white-tolex model, which adds another rare touch to a beautiful and precious vintage Fender guitar. A highly desirable Mustang with full pre-CBS specs (Kluson tuners, Brazilian rosewood fretboard, clay-dots) with the most sought-after of the three standard finishes: Daphne Blue. This guitar is ALL ORIGINAL and in very fine conditions, complete with original hardshell case, original jack cable and vibrato arm. Just perfect! The model was introduced by Fender in August 1964 and this guitar was built during the first year of production: its neck is dated January 1965, pots are dated 20th week of '65, grey-bottom pickups are dated May 18th and 19th, 1965. The beautiful fingerboard has frets in excellent conditions, nice action and playabilty. This Mustang has been very well cared-for and its original Daphne Blue finish shows just a few traces of wear, mostly on the lower part of the body. Almost no oxidation on the metal parts, no breaks and no shrinkage on the plastic ones. Pickups, potentiometers and switches are all working fine: a really solid guitar in "collector's condition". By the end of 1965 Fender started to replace the Kluson Deluxe tuners with the "F" model, but this guitar still has its original set of plastic-button double-line Klusons, never replaced and in good working order. The old-style clay-dots, instead of the pearl ones, are typical of the earliest Mustangs and are a distinctive sign of the pre-CBS Fender era. The original hardshell case is in very fine shape, its only flaw being a red stain on the top which can be removed by a new owner more patient than me. Features, sound, conditions, originality and production-year, make of this guitar THE Mustang to have! Among Gibson guitars, the L-50 boasts a long history, with the same model's name given to radically different instruments for both typology and construction: from round sound-hole to f-holes, from flat to arched back, from smaller to larger body-size, the L-50 stands in an intermediate position between the cheaper student-grade models and the more expensive professional guitars. Built during World War II, this guitar embodies the most prestigious version of the model, with a 100% solid-wood construction with carved-spruce top and carved-maple back, one-piece mahogany neck with truss-rod, and rosewood fingerboard and bridge. The headstock shows the silkscreened "banner logo" typical of the period, with the "Only a Gibson is Good Enough" motto. War-time guitars are often characterized by features imposed more by the hard times than by marketing or construction choices, so they often show unusual solutions - and not necessarily negative ones. This L-50 still has the correct metal trapeze tailpiece, without the wooden cross-bar usually found on war-time models due to metal shortage, but what's more surprising is the high-quality wood used for the back of the body. The heavily flamed maple, although not carefully "bookmatched", is stunning. At the same time, the total width of the two halves was not enough to reach the 16" of the body, so we see two more stripes of maple added at both sides of the lower bout. Yes, we'd never see that on an L-5, an L-7 or any other professional-grade instrument, but such solution must have been considered good enough for a "war-time" L-50. Another "cheaper" solution which differs from the higher-grade Gibson archtops is the neck-body joint: the fingerboard extension is not elevated from the top of the guitar, but glued to it instead, which reduces a bit the vibrating area of the sound-board. The guitars of this intermediate-grade have no serial number, so we can tell the year of production by its specs, such as the logo. Through the f-hole we can see the ink-written name of the original owner, a H.G. Lawrence who purchased the guitar in the '40s in Claremont, New Hampshire, at Bush Music Studio: a shop's label is glued both to the back of the headstock and the hardshell case. Such detail reveals that the latter, although originally produced for a Vega archtop, has always been with this guitar since it first left the shop. All the hardware is original, from the tortoise-plastic pickguard to the riveted-rod individual Kluson tuners, to the pre-compensated rosewood bridge. The finish is completely original, with a beautiful sunburst on the top and darker back, sides and neck. It's in great shape, with lots of nice checking and a few traces of playing wear. This guitar sounds really great, and can proudly stand any competition against a top-of-the-line archtop. Beautiful fretboard, perfect intonation and easy action. Sound, playability, beauty and rarity make of this L-50 a cheaper but classy alternative to the more expensive Gibson archtops. It comes with a certificate of originality signed by George Gruhn, who has personally inspected he guitar in 2004. 100% original guitar, the simplest and baddest of the Les Pauls. I was adding "the cheapest" but that was a long, long time ago. Introduced as "entry-level" Les Paul, the Junior offered to the young guitarist the classic Gibson quality at an affordable price, with a simple but solid construction and single-pickup circuitry. The single-cutaway slab body is made of one piece of mahogany, and the flat top has a beautiful sunburst shading, which has lightly faded through the years (see the picture without the pickguard). 1958 is the last year of the single-cutaway version, the most sought-after by collectors and players alike. The neck, firmly glued to the body, is one-piece of mahogany and has a dark brazilian fretboard with dot inlays. It's fantastic, a thick but comfortable '58 neck. The headstock front has the silkscreened Gibson logo and model's name, and is equipped with the original Kluson Deluxe single-line tuners, with original oval plastic buttons. The top has a thick black-plastic pickguard with only three screws, original and with no breaks, original volume and tone knobs and the single P-90 pickup with plastic dog-ear cover. This original pickup is powerful and aggressive, and gives the guitar its unmistakable r&r voice! The bridge is the wrap-around bridge/tailpiece combination, with the strings wrapped over the aluminum bar, which is bolt to the top, and factory-angled for intonation, but a finer adjustment can be achieved via two hex screws on its sides. This simple but effective device adds sustain and character to the guitar's sound. The back shows a nicely grained-mahogany and the pots cavity shows original pots and the "bumble-bee" capacitor made by Sprague. This Junior has lots of beautiful checking, some body-edge wear and a few heavier marks on the back. However it is in overall excellent conditions, well-kept, very solid and all original, with an exceptional sound and a dream neck, and that special street-warrior look that adds so much to the Junior's appeal. Its only flaw is the brand new and perfectly fitting SKB hardshell case. Of course we were hoping to find its old "gator-case" but... that's ok anyway! The SG version of the Les Paul Junior, featuring the typical pre-compensated wrap-around bridge and the single black-plastic dog-ear P90. Les Paul’s signature is here still on the headstock, from which it will be dropped shortly after, leaving the guitar only the SG name. Body and neck are mahogany, mother-of-pearl dot inlays on a rosewood fingerboard, silkscreened gold Gibson logo. The guitar is in very good condition, sporting all its original parts, except for the tone cap. Pots are both marked 32nd week of 1962. All plastic parts are in good condition (knobs, pickguard). The guitar has had a few parts replaced over the years, but the original parts were fortunately kept and later reinstalled. In particular, the single-line 3x3 Kluson tuners had been replaced with individual Kluson-type ones. Reinstalling the original tuners has covered every sign of the others, with the exception of a tiny mark at the body end of each of the tuner’s plates, as clearly shown in the pics below. The front of the headstock shows a touch-up spot near one of the tuner’s bushings. The second mod the guitar had undergone was the replacement of the pickup. In fact, as can be seen by removing the now-reinstalled original P90, there is a slight widening and deepening of the pickup cavity, made to fit a humbucker. This reshaping is totally hidden by the original cover of the P90 in place, the only signs being two barely visible plugged screw-holes for the humbucker’s mounting ring, on the side between the P90 and the bridge. The pics show all this in detail. This SG Les Paul is extraordinarily light, perfect as regards both luthiery and electronics, with a really great sounding pickup. The neck-body joint, a typical weak point on this model, is here perfectly sturdy and solid. Action is perfect, making for really easy playing. The rosewood fingerboard shows some wear, but this can not be felt, thanks to the frets in great condition. Finish is in good overall condition, with the cherry red still rather bright on the body, only slightly faded on the neck, and no worn-through areas. A few dings and bumps, the most evident of which is on the back edge by the control cavity, as shown in one of the last pics. As one may guess from the pics and the history these tell us, this guitar belonged to a "real" musician, for whom the quest for the sound came before the obsession of having to keep an instrument in its original condition. This said, here all the parts were wisely kept, in times when the concept of "vintage" applied to guitars was yet to come, and often replaced parts simply got tossed. This mindfulness has allowed to get the guitar back to its original condition. Every inch of this guitar screams "live performance": buy it to play it, not to hang it on a wall, and be sure you will be taking home a guitar that is "right", sound and original, spending 30% less than what you would for an identical but "mint" one but which, make no mistake, would not play like this baby. The guitar lacks its original HC, but will ship in a good quality Gibson gig-bag, and expertly packed. This version of the SG Standard was produced only for two years and was launched on the market in 1971 with the name of SG Deluxe, in order to emphasize a parallelism with the Les Paul line. However it was an atypical design, which kept the same woods as the Standard - and the same twin- humbucker circuitry as well (both pickups had the embossed logo on their covers). All the electronics were installed on a large semi-circular plastic plate. The guitar you see here is a very fine example of the model: as you can see, the hardware includes a modern Tune-O-Matic "Nashville" bridge and Grover tuners with the double brand Grover/Gibson. Gibson brand appears also on the Bigsby-style vibrato tailpiece. The body is entirely made of mahogany, just like the three-piece neck, in the tradition of the SG line. This guitar is in excellent and 100% original condition. The four potentiometers are dated March '72. There is some light playing wear both on body and neck, some re-soldering trace in the pickup covers, a good refret job with larger jumbo frets, a rubber-foam pad inserted under the bridge pickup. This Deluxe is in overall great conditions, solid, and professionally set-up, plays and sounds great and has always been kept with care. A quite rare version of the SG with a classic sound and a different look, which comes with a non-original hardshell case. GIBSON ES 330 TD, 1965. Ice-Tea Sunburst. From the McCarty era, Gibson Company's Golden Age, we bring to you this gorgeous thinline, with an Ice-Tea colored top in the typical mid-60s style. It's a lighter sunburst which goes from yellow to a reddish brown, but not so red like the cherry-sunburst. Well, you'll probably already know the model: the laminated maple body has the same shape and thickness as the 335, but it's completely hollow, without the maple-block inside. So it's a thinline hollow-body, a very lighter instrument if compared to the semi-solid thinlines. There are many details that set this guitar apart from the later version of the 330, of which one example is shown below: the single-piece mahogany neck joins the body at the 16th fret (instead of the 19th), the neck-headstock angle is 17° (it is 14° on post-65 Gibsons), the nickel plated tune-o-matic bridge still has metal saddles and the old ABR-1 marking, the knobs are the old-style "reflectors". The other specs are the same: two P90 pickups with metal covers, Kluson Deluxe double-line tuners with plastic oval button, brazilian rosewood fretboard with block inlays, pearl logo, trapeze tailpiece. As all the pictures show, it is a very clean, 100% original guitar in excellent conditions. The finish is in great shape, with some nice checking and some belt-buckle wear on the back. Excellent playability, beautiful loud and aggressive voice with the classic P90 attack. A very well-built, well-kept instrument. It comes with a later ('70s) original Gibson case, perfectly fitting and in good condition. GIBSON ES 330 TD, 1968. Sunburst. It's the second version of the 330 with the neck/body joint at the 19th fret just like the 335s. This feature gives these guitars a more familiar look and a much better playability with full access to all the fretboard, unlike early 330s which had shorter necks with the pickups located in the middle of the body. This late 60s version looks very similar to the 335 but is a very different instrument due to the completely hollow thinline body with no maple block inside and the two P90 pickups instead of the humbuckers. The P90 covers are chrome-plated, even though they look black in the pictures (only a reflection). Maple body, mahogany one-piece neck, rosewood fretboard with binding and block markers, headstock with no crown inlay and old-style pre-pantograph pearl Gibson logo - full '60s-style. All original parts: pickups, knobs, trapeze tailpiece, tune-o-matic ABR-1 with nylon saddles, Kluson double-line tuners with oval plastic button. The top has a gorgeous sunburst finish, while the back is dark walnut like all the 330s of the same period. The guitar is in excellent conditions and completely original, with a nice fretboard and great action, aggressive sound and well balanced pickups. The only flaw we see is a very small plugged hole from a strap-button screw on the upper shoulder (in a very stratocasterian position), but it's a very minor flaw and almost invisible. The guitar comes with a non-original, good-quality hardshell case. Cherry Red, a very special guitar that I know quite well: "Cindy Lou" has been my main guitar for many years, I even dedicated a song to her. It's the classic Stereo-Varitone version of the top-of-the-line among Gibson thinlines, which differs from the 335 for the multi-ply binding, the ebony fretboard with large mother-of-pearl inlays, the gold-plated hardware and the vibrato tailpiece. The cherry red finish was standard for the model since its introduction in 1958. Cindy has all the typical features of mid-60s 355s: laminated maple body, one-piece mahogany neck, lyre-engraved Vibrola Deluxe tailpiece, tune-o-matic bridge with nylon saddles and Grover Roto-matic tuners. The guitar is ALL original. Both pickups are "patent-number" humbuckers, with covers never dissoldered. The only modifications were required by myself and made by luthier Salvatore Mancuso (www.mancusoguitars.com) in 1995: a complete refret job, masterfully executed without cutting the binding edges, and a small rod which anchors the tortoise pickguard to the pickup ring to keep it from warping.... a solution that has stood the test of time... after 17 years, the guard is back to its "flat" condition. The guitar is in excellent shape, with a beautifully unfaded cherry color. The original hardware has lost some of its gold-plating, which is gone from the pickup covers and heavily worn on the vibrato plate and the tuners. The original stereo-varitone circuitry is untouched, with the "choke" typical of the 355 and 345 wiring. This instrument has exceptional sound and playability. What a thrill to hold her again in my arms... she's looking for a new home and I hope she'll find a new loving owner, because that's what Cindy Lou deserves. Original black/yellow hardshell case, quite worn but in good conditions. GIBSON ES 335 TD, 1968. Sunburst. Antoher gorgeous 335, in 100% original condition. Rare flamed maple top. Thinline semi-hollow maple body, one-piece mahogany neck, brazilian rosewood fingerboard with pearl block inlays. Typical features introduced in 1967, such as the "top-hat", Fender amp-style control knobs; patent number tune-o-matic bridge with metal saddles instead of nylon; thinner five-ply plastic pickguard. The hardware is all original, chrome plated and in excellent condition: trapeze tailpiece, Kluson Deluxe double-line/double-ring tuners, two Patent-Number humbucking pickups, never touched or altered, with covers never removed. We have tried to take pictures of the hidden side of both units, but one screw of the bridge pickup was so rusty that we could not take it off, so we did our best trying to show the black decal inside without forcing and damaging the plastic ring. However, the decal is there and all the solderings are untouched. The beautiful sunburst finish is in overall very good conditions, with some weather checking, a few dings here and there and not too much playing wear. It's quite rare to find such a beautiful flamed top on a vintage '60s 335, so we were really pleasantly surprised... 'Burst finish, sweet checking and flames, what a nice vintage combination! Straight neck with not too much wear, easy action, comfortable profile and width, good frets and nicely darkened rosewood board. This fantastic 335 has a great bluesy sound, loud, aggressive, warm and powerful. It comes with its original semi-hard case (half-way between the hardshell and the soft cases offered at that time) with brass Gibson plate, in excellent, solid condition. How about another 335? Well, how could we let her go? The beauty of the woods and the sunburst finish, the warm and powerful sound, the magic neck profile, the perfect originality of every part and the exceptionally fine conditions immediatlely conquered us! This guitar has all the typical specs of the 1967 - early '68 models, with a one-piece mahogany neck, tune-o-matic bridge with nylon saddles and a very comfortable neck with a beautiful fretboard made of Brazilian rosewood. The body has a mild-figured maple top and an even more beautifully figured maple back, with both mild flames and bird's eye. From this point of view, 1968 is a very special year, as you can also see from the other '68 thinlines in our list, both guitars and basses. Everything is 100% original: chrome hardware includes the trapeze tailpiece, the tune-o-matic bridge and the Kluson "double line - double ring" tuners. The two humbucking pickups with Patent Number label are absolutely original and untouched, with intact cover solderings. The knobs are the "witch-hat" style, the fretboard has pearloid block inlays, and both the Gibson logo and the crown inlay on the headstock are of real mother of pearl. Not a single screw has ever been changed. The guitar is very light, frets and fingerboard are in great shape, the sound is the great '60s Gibson 335's sound: the one you have heard a million times from your old blues records, but also one of the most versatile sounds of all the elctric guitars. There's not one style that makes a semi-hollowbody Gibson feel out of place, and this guitar is no exception! It's ready to play, with no need of any adjustment, and is - plainly - gorgeous. It comes with a beautiful Gibson hardshell case, probably from the '80s, in excellent condition and very solid. Cherry red. One of the greatest Blues Machines. Born in 1959 as a stereo version of the 335, the 345 has a special circuitry featuring the Varitone rotary switch for five capacitor-filtered sounds and bypass (signal first goes through a choke visible through the bridge pickup cavity, and then reaches the Varitone), and can be used with two separate amps via an Y cable, or with a single amp with a stereo-to-mono cable. Other special features include gold-plated hardware, triple layer top binding and double parallelogram fretboard inlays. The guitar you see here was built in 1968. It is completely original and in exceptionally fine conditions. It has a very beautiful see-through cherry finish with gorgeous wood-grain showing through, with normal amount of checking but with no heavy dings and no belt buckle wear. Beautiful one-piece mahogany neck and easy-playing rosewood fretboard, wide enough for easy bending. Only the gold-plating wear (especially on pickup covers) reveals that this guitar didn't leave the factory one or two years ago. Original pat. # tune-o-matic bridge with nylon saddles and retaining wire, original and untouched humbucker pickups with Patent Number label, original Kluson Deluxe double-line tuners. This instrument has all the mid- '60s features: trapeze tailpiece, pre-pantograph pearl Gibson logo, 'top-hat' knobs. Beautiful deep red color, a little darker than early '60s bright cherry. All the electronics work great. The sound is the beloved voice of the Electric Blues, with long, singing, sustaining notes, with a fair amount of badness provided by the bridge pickup. This ES 345 comes with an original Gibson hardshell case with logo, which in my opinion is from 1970 or '71: of course I cannot guarantee it was originally sold with the guitar, but is correct for the model and perfectly fitting. The original marijuana-made decorations on the top of the case have been removed by its last owner. The original Gibson care and maintenance booklet is included. A true "workhorse" of the '70s musician, the Deluxe has kept alive the Les Paul sound and look through the most difficult years of the US guitar industry, keeping quality standards high enough to be still considered a classic. Among all the Deluxes, the Gold Top version is the all-time favorite and we are pleased to have one in our collection. Built in 1975, this guitar is a typical mid-70s Deluxe with a "sandwich" mahogany body and a maple top; the neck is made of three pieces of maple and has a rosewood fretboard. The guitar is all-original except for newer Gibson Deluxe tuners, which have replaced the original Gibson-by-Kluson units, after another set of Grover had been used with no visible sign or additional screw-holes. This is a very minor issue, since there is no visible trace of other tuners and the re-installation of a correct original set will bring back the guitar to its fully original condition. The neck has a very nice and comfortable profile, not too fat and not too narrow, I would describe it as a wide-flat neck reminding me of a 1960 shape. The gold finish is in more than excellent condition, without the greenish worn areas commonly seen on these instruments. Accordingly, the mahogany back is also beautiful and in great shape. Except for the above mentioned tuners, all the hardware is original: tune-o-matic Nashville bridge, stop-bar, "metal-cap" control knobs (one was broken and has been carefully repaired). The original circuitry includes the mini-humbucker pickups; as often found on '75 Deluxes, one has the old-style black label while the other one has the impressed patent number. The latter has also an ink-stamped date, october 31st 1975. Another 1975 date (september 9th) is stamped inside of the pots cavity and all the 4 original pots are dated 35th week of 1975. The back of the headstock has the impressed '2' which was given to the "factory second" guitars, usually for minor finish flaws that, as is the case with this guitar, today are undetectable. The guitar is really beautiful, in great condition and plays/sounds great, and comes with its nice and original black hardshell case. GIBSON LES PAUL 30th ANNIVERSARY GOLD-TOP, 1982-83. The Gold-Top 30th Anniversary belongs to an interesting page of Gibson's history: the first "serious" attempt at producing new Les Pauls by following the correct path of the model's tradition. The new Limited Editions such as the Heritage 80 or this gold-top version were all equipped with the humbuckers designed by Tim Shaw, great-sounding units that have already reached the status of "classics". By the way, it should be pointed out that, although online-forums and online-"experts" often call "Shaw" every Gibson humbucker built in the early '80s, the only REAL "Shaws" are the ones with the numbers 137 (neck pickup) and 138 (bridge) stamped on their back, with other numbers identifying year and month. Each and every Heritage 80 and 30th Anniversary we have had in our hands feature such pickup stamps, since august 1980. In this guitar, a december '82 date is stamped on the pickups, and a 1982 date is also shown on the potentiometers, which are original like all the parts of the electric circuitry. This Les Paul screams "classic" also in its construcion: one-piece mahogany body with maple top, one-piece mahogany neck with rosewood fretboard, gold finish on the top and Kluson-style unmarked double-ring tuners. Like the pickups, also the hardware is more '57 than '52-inspired, with the typical stop-bar and ABR tune-o-matic bridge. This choice led to a very successful model, which inspite of its rarity, today is highly regarded by collectors and players alike, for its great sound, classic look and exceptional playability. The guitar is 100% original and in exceptionally fine conditions. The serial number's code for the model differs from the regular poduction line, starting with a letter which identifies the year: this instrument was shipped in early 1983, and all of its parts were completed and dated within december 1982. It comes with a nice, tweed-covered hardshell case, not the original but a very good one. We welcome back this gorgeous guitar after a complete binding restoration. The job was done by luthier Salvatore Mancuso using exactly the same material, dimentions and colour of the original. Now the guitar is perfectly playable and we have taken many new pictures. While on the vintage market you see a lot of late and post-64 Country Gentlemen, it is very difficult to find late '63 or early '64 guitars with ALL the features of George Harrison's second Gent, one of his trademak guitars, used on many Beatles appearances and recordings, among them the milestone Ed Sullivan Show USA appearance of February '64. After that show, Gretsch was pressed by public's demand to increase the production of Country Gentlemen. Unfortunately, in spite of production increase and sales boom, the new Gents were radically different guitars from George's original. This wonderful early '64 Gent has ALL the right features: two FilterTron pickups (not one FilterTron and one SuperTron), double mutes with red felts (not the black-felt mutes, and obviously not the later single mute), Grover Imperial tuners (not the later "Kidney-Button"), plain pickguard with Gretsch logo (without model's name), serial number and model's name on the gold placque on the headstock front (and not stamped on the headstock back). All the parts are original, and the guitar is in overall excellent shape. The neck is straight, solid, with easy and low action. Its finish is checked along the middle-line, where the two parts are glued together, but there is no crack in the wood underneath. The finish is in overall good conditions with some playing-wear on the neck and the usual signs of wear of a well-used but non-abused guitar. Some spots show more checking, like the headstock front and the lower bass-bout. There is the typical damage to the finish beneath the back-pad which covers the back cover-plate, caused by contact between finish and backpad's plastic, but this is completely invisible when the back pad is in place. All the gold-plated parts are quite worn and there is some rust on the switch tips. It comes with a beautiful, near mint and original hardshell case, even complete with its case-key! The guitar has a fine sound, plays well and all the electronics work properly... and it's gorgeous! With the 6120 and the White Falcon, the Harrison-style Country Gentleman is the most sought-after Gretsch archtop on the vintage market. Natural. Exceptionally rare guitar. Besides all the standard features of the 6193 model for 1960 (two Filtertrons, two volumes + master knobs, tone and pickup selector switches, Grover Imperial stairstep tuners, "space-roller" bridge, etc.) this guitar has many rare appointments. First, a laminated spruce top instead of the usually-seen maple. Laminated five-piece neck (maple and prob. mahogany), just like the 6120 from the same year you see in our private collection, only 110 digits away from this one's serial number. The body is made of highly flamed maple, absolutely gorgeous. And most of all, there is a detail we have never encountered on a Country Club: the "sound post" inside of the body, typical of single-cut 6120s, early Tennesseans and a few Anniversarys, like the '59 you see in the archive section of the list. The sound post connects top and back, giving the guitar a greater rigidity, to avoid feedback problems when played really loud. Another interesting feature: FilterTrons are one "Patent Applied For" (PAF) and one Patent Number, not uncommon for 1960, when both types of cover were used. G-cutout tailpiece, "neo-classic" ebony fretboard with thumbprint inlays, G/arrow knobs. Every part is 100% original, in excellent plus condition. No heavy dings, no heavy wear. The only cosmetical flaws are a heavy gold-plating wear of the hardware, almost gone from knobs, switches, pickup covers, and a small piece of binding missing from the headstock front. The binding deterioration, so common on '60 Gretsches, was becoming a real problem on the guitar's body, since it just could not be stopped in any way. So, instead of keeping on touching it up by replacing the damaged pieces one at a time, we have chosen to ask our luthier Salvatore Mancuso to complety restore it. The restoration job is just perfect, since Mancuso has used exactly the same material, dimentions and colour of the original binding. More rare details make of this guitar a true "collector's item": inside of the clean original hardshell case you'll find also the original Gretsch Warranty Card and the "OK Card" control tag, bearing both the guitar's serial number. Rare and interesting indeed! All in all, an exceptional guitar, rare and beautiful, with the same sound and circuitry of period's 6120s, but with an unique look and personality, with a great natural blond finish and a fantastic flamed maple body. GRETSCH 6119 Chet Atkins TENNESSEAN, 1960. Introduced inl 1958 as the budget model in the Chet Atkins line, the Tennessean mod. 6119 is a killer rock & roll machine: a basic circuitry with a single FilterTron (in this case a Pat. App. For) pickup, a graceful single-cutaway shape, a flashy red finish, a Bigsby. Few guitars have such a strong personality. The later Hi-Lo Tron version which replaced it was totally different from the original design. From a structural point of view, a 6119 from '60 is very similar to a 6120 from the same period. Both the neck and the body, thinner than a regular full-bodied archtop, are made of maple, and through the f-holes you can see the "sound-post", the rigid bracing system which connects the top to the back, conceived to reduce unwanted top vibration and feedback for louder electric volume. Other features similar to the 6120 are the oval-button Grover tuners, the straight-bar bridge, the zero.fret, the 'neoclassic' fingerboard with 'thumbprint' inlays, the Gretsch By Bigsby vibrato, the "signpost logo" with Atkins signature on the plastic pickguard, which is black on the Tennessean and gold on the 6120. Less hardware, with only one pickup, one volume and one tone selector switch, also means a lighter instrument, with a lot of acoustic resonance, in spite of the soud-post inside. Unbound rosewood fretboard. The neck-body joint shows the typical neck-dowel in the cutaway. The guitar is ALL original. Pickup and circuitry are untouched. FilterTron's cover still has the Pat. Applied For (P.A.F.) stamp. All the chrome plated parts are in almost perfect conditions, while the nickel-plated brass tuners show more wear. The strong red finish is in excellent shape with light checking, and only the neck shows heavy playing wear, as pictures clearly show. The neck is straight and solid, with some hairline finish cracks in the neck-heel area, but no signs of structural issues. Binding in good conditions. Beautiful sound, loud and aggressive, with the legendary FilterTron attack. Perfect action and frets in good conditions. The guitar has its original hardshell case - a little too deep, as always happens with these early thinner guitars, but beautiful and solid. One of the earliest 'electrotone-body' Tennesseans, semiacoustic thin hollowbody with fake f-holes: only the earliest examples like this one feature 'unbound' fake Fs! The new version Tennessean had two single coil Hi-Lo Tron pickups, whose volume is controlled by two single potentiometers on the lower bout, plus one master volume on the cutaway bout. Two switches on the higher bout select pickups and tone, and a third switch near the knobs works as 'stand-by', to turn off the guitar without disconnecting the amp. Laminated maple body, finished in a see-through mahogany red, brighter on the top, with very nice wood grain showing through. Just like the single-pickup version, the neck joint features the typical neck-dowel. Rosewood fretboard has zero.fret and 'thumbprint' inlays. Chrome hardware is the same type found on earlier version 6119 (and 6120): G-Arrow knobs, large straight-bar bridge with ebony base (it will have a smaller bar in later years), original V-Cutout "Gretsch by Bigsby" vibrato, Grover Sta-Tite tuners with oval buttons. Excellent Plus condition: as rarely found on Gretsches, binding is in perfect conditions; issue-free straight and solid neck; perfect action, electronics work fine. Finish is in excellent shape, with some checking but with no heavy signs of wear. The only flaw, clearly shown in the pictures, is some damage in the finish at the base of the headstock caused by a wall-hanger - I think we can do something to make it look better (light sanding and buffing) but it won't completely disappear. On the flip-side of the original pickguard the old owner has added a decorative scroll, which can be removed by spraying a new coating of silver lacquer: we have chosen to leave it, since it is part of the guitar's history and doesn't affect originality in any way. Great-sounding guitar, very light and well-built. George Harrison used this model with the Beatles: his was a '63, I think, without the metal placque on the headstock front just like this one but with white binding on the fake f-holes. The guitar comes with its original hardshell case, a little too large inside like all G cases of the period, but very nice and solid. MARTIN D-18, 1971 one of Martin's classics, the mahogany-body dreadnought. Clear and powerful sound, loud volume, deep basses. Back and side woods show a beautiful figure, and the guitar is in overall excellent condition. A stabilized hairline crack in one side (Martin factory installed small mahogany diamonds inside of the rim, see detail 4), and top's finish shows a few hairline cracks due to wood's movement through the years (see details from 1 to 3). The top has the typical 'S' shape, higher from the bridge to the bottom, lower between the bridge and the soundhole, and is very solid and stable. Perfect action, solid and light guitar. Original Grover Rotomatic tuners, like all Martins of the period. A fine yet simple instrument, with its original hardshell case. RICKENBACKER 330, 1966. Mapleglo (natural) finish. A 40 year old guitar in unbelievable conditions, near mint and 100% original. Among regular-scale Rickenbacker thinlines, the 330 was the standard-feature model, with unbound clear-coated rosewood fretboard with dot inlays, and unbound slash soundhole and body. As suggested by the final 0 in the model's name, the 330 had the regular chrome-plated R tailpiece instead of the vibrato. The body has the typical half-moon double cutaway shape, with sharp edges. The two-level, white plastic pickguard has all the controls in the lower part: individual tone and volume, pickup selector and tone-blender, the fifth small knob which mixes to the selected pickup's sound the signal of the un-selected one. The pickups are two classic "toaster" units. The beautiful see-through natural finish reveals the gorgeous maple wood. The neck is three-piece laminated (maple-mahogany-maple), and two more mahogany wings are added on the headstock. Orignal individual Kluson Deluxe double-line tuners. The thick rosewood fretboard shows a little wear in the clear finish, and has a darker color in the 12th fret area, due to the natural color of the wood rather than to playing wear. All original harware and circuitry. Pots are dated 33th week of '66, while the serial number on the metal jack-plate has a September '66 production code. Exceptionally fine conditions, only almost invisible signs on the back, just as if the guitar has left the shop 4 months ago, and not 40 years. I'ts impossible to find '60s guitars in this condition, and we were lucky enough to find two from the same owner. This gorgeous 330 comes with a nice Rickenbacker modern hardshell case, the correct reproduction case sold with all the vintage reissue models. RICKENBACKER 365, 1966. Natural Mapleglo finish. Mint and 100% original conditions! How many times have you heard us call "mint" a guitar? This one is over 40 years old and looks like it has left the shop a few weeks ago. In the Rickenbacker line, the 365 was one of the deluxe models, with bound rosewood fretboard with triangular "crushed pearl" inlays, bound slash sound-hole, "checkered binding" on the back side of the body. Basically, the 365 was the vibrato version of the 360 model. The tailpiece is the classic '60s "Ac-cent" chrome plated vibrato. The graceful half-moon shape of the body was changed around 1965 with rounded body edges, and for a few years both version were marketed at the same time. Among the best looking features of the Rickenbacker's design there are the single slash sound-hole and the two-level white pickguard. On the guard's lower side, there are five control knobs and the pickup selector switch. This is the classic Ric's control scheme, which adds to the regular individual volume and tone controls the new (and often misunderstood even by famous Ric users) "blender knob", conceived to gradually mix-in sounds from the unselected pickup to the selected unit's voice. The pickups are the typical "toaster" units, so closely associated to the look and sound of the '60s Rickenbackers. The large jack-plate has two sockets for the stereo Rick-O-Sound effect, with the signal of each pickup sent to a different amplifier, but you can use the guitar with a stadnard single jack. The clear Mapleglo finish enhances the beauty of the maple of the body. Maple is also used for the neck, with a darker central mahogany large laminated stripe. Two more darker mahogany wings are added on the heastock. The tuning machines are original Kluson Deluxe double-lines. All original hardware and circuitry, with pots dated 40th week of '66. The serial number is from December of the same year. Absolutley perfect "museum quality" conditions, only a very few minor signs on the back, almost invisible and impossible to show in the pictures. You'll never seen another one in this condition. It comes with its original hardshell case in silver tolex, in excellent condition. NATIONAL STYLE 0, 1933, from my personal collection. Featured on italian magazine Guitar Club June 2004 issue, pages 76-77. Nickel plated brass body with sanded hawaiian scenes, 12 fret round neck. The nicest version of the Style 0, the one with the 'rolled-in f-holes' and the ribbed cover-plate. Structurally solid, this guitar is in excellent conditions both in function and look and has the typical loud and sweet sound of brass-bodied Nationals. Perfect ebony fretboard with pearl dots and new frets. Original and well preserved logo. Original cone. On the flip-side of the cover-plate somebody etched "WS AUG 1934", maybe the original owner. Many pictures online: we have tried to document beauty and originality, but also the flaws: a dent on the lower body rim (dent); the bridge cover re-soldered to the cover plate (cover); the replaced binding on the treble-side of the fretboard (binding); the back of neck probably sanded to wood and then oversprayed (neck) with a non-original strap button and a hole from another button now removed (neckjoint). Tuners: these are Klusons, and rivets instead of screws reveal they are from the late '30s or early '40s, so they are not the ones originally installed; probably the guitar has been used for a while as a straight hawaiian lap-guitar, as a string-raiser mark behind the nut suggests, and tuners were reversed upside down with the buttons towards the headstock front for an easier access: now they are in the correct position and there is a small hole visible right above the plate from the old reverse position (see tuners). You know we love to describe avery flaw with the greatest care... but now let's talk about how beautiful and rare this guitar is! Nickel is shiny, sanded drawings are clear, sound is fantastic, conditions are stunning for its age. Sorry, no case at the moment, we hope to locate one soon. Among the early Kramer models produced after the end of the partenership between Gary Kramer and Travis Bean, the DMZ Custom line directly inherits Bean's innovative ideas. The aluminum neck is the most evident trace of Travis Bean projects. Two maple inserts, however, give to the neck a more familiar wood feel, while keeping metal's sustain and crushproof-ness. Even more flashy is the forked headstock, built in one piece with the neck, where the use of aluminum stands out also as an aesthetic choice. Aluminum is also used for the dots in the Ebonol-made fingerboard, another innovative solution for such an innovative guitar. The DMZs offer several options of Di Marzio pickups. The "3000" you see here is equipped with three single-coil SDS units, wired in the typical scheme of a Strat, with pickguad-mounted 5-way selector switch and jack socket. The guitar's body is all made of maple and the instrument is not feather-weight, consistently with the trend of a time when the dubious equation weight/sustain was quite popular. The guitar plays effortlessly and sounds like a supercharged Stratocaster. It is 100% original and in excellent conditions except for a small crack in the pickguard between pickup and bridge. An interesting mix of tradition and innovation, built in the most difficult time for American guitar industry - when all the major makers built their all-time worst instruments. Early Kramers used to match quality and marketing strategy, in keeping with the musical trends and building good guitars that "picture an era" much better than other well-known names. This DMZ 3000 has no case, but comes with the original Kramer shipping box, labeled by Kramer's import agent for Italy, Meazzi. For the musician who wants to widen his sound options, and a wisw choice for the collector who is looking for the new frontiers of vintage guitar collecting. HOFNER 468 ARCHTOP "Committee", 1963-65. The 468 model was the european cousin of the UK-market Committee, which differed from the Selmer-distributed version for the headstock and fretboard inlays. After the 470 model (the Golden) the 468 was the best Hofner electric archtop. The guitar you see here was built between 1963 and 1965, as we can tell from the small-surround "staple" pickups and the rare 4-knob and NO selector switch control scheme, more common on the UK version. Spruce top, gorgeous birds-eye maple back and sides. With a different name on the headstock (... starting with G) a guitar with such beautiful woods would cost 15.000 euros! Five-piece neck, nice bound rectangular pearl/rosewood fretboard inlays. Beautiful back decoration, typical of higher level Hofners, and multi-layer pearloid body binding. This guitar is very solid, has easy action, no neckset issues, and electronics and tuners work great. Very light and accurate construction. It is fitted with a non original bridge, and the pickguard and the original case are missing. Excellent condition, and the great Hofner "alternative" sound. A very special thank you to Steve Russell of www.vintagehofner.co.uk, a nice website dedicated to vintage Hofner guitars and basses whcih you'll surely like! sunburst, 100% original. Another JB in unbelievable conditions, shipped to us through a time machine. Perfect sunburst finish, almost new on the top, with no blet-buckle wear on the back and only a few body-edge wear signs. Tortoise plastic pickguard with no cracks, finger-rest in the old-style lower position, 4-bolt neck plate, bound rosewood fretboard with large block markers, light alder body. The light green stamp which replaced the neck date in the '69-'71 period is not clearly visible, but many elements unmistakably identify this bass as a '71: pots are all dated 16th week of '71, grey-bottom pickups are stamped 2311 = 1971. The neck itself, once disassembled and tipped-over, clearly reveals the mirror image of the body's neck-pocket paint. It is an untouched, un-altered, perfectly original bass. From a functional point of view, this is a great instrument: very light, with a fantastic action, a straight neck, a huge sound with two powerful pickups, 100% gig-ready. From an aesthetic point of view it is near-mint, in the "Real Vintage acceptation" of the word, which is the "mint" of 99% of the other shops. Its beauty is completed by the original chrome covers (bridge cover still has the rubber foam mute) and the beautiful original black tolex case with Fender logo. White. One of the favorites of the bass players from all around the world, in the rare white version with black binding and pickguard, in exceptionally fine and 100% original condition. With the only exception of a newer screw at the E-string tuner, it is exactly in the same condition it was when it left Rickenbacker factory in May 1976. Both truss rods works fine, the action is great and the original frets are in very good shape. All the pots are dated 1975 and 1976 and the Rick-O-Sound circuitry with the double jack socket is absolutely original, including the capacitors and, of course, the pickups. Same as the hardware: bridge, saddles, tuners, knobs, everything is original. When you find an instrument in such condition, there's not really need to say much: just perfect. The traces of playing wear are minimal, the neck is straight with almost no wear. The bridge pickup-cover is missing. If you are looking for the classic Rickenbacker sound, a mainstay in the musical palette of any rock bassist, here you have a really fine instrument. It comes with a beautiful skin-covered hardhell case. The EB-2 was the bass in the thinline serie (335, 345, 355), of which it shared the symmetrical double cutaway design and the semi-solid construction with a thin hollow body with a solid maple central block. Two controls, one humbucker pickup with metal cover, "baritone switch" to cut-off some frequencies. Bridge with typical-for-the-period nylon saddles, complete with its chrome cover. Original laminated pickguard, and all parts are correct and original. A beautiful instrument with a fantastic look, in great shape and with an excellent action and a great sound, a valid alternative to the Fender bass sound, thanks to the shorter scale and the semi-hollow body. The non-original case is very well made and perfectly fitting, since it was professioanlly custom-built for this particular instrument. RICKENBACKER Electro LAPSTEEL, 1946, Bakelite body, horseshoe pickup, a classic among first-generation Lapsteels, very attractive and fine-sounding...Loud! Absolutely perfect condition! Sold with steel-bar slide and original tweed hardshell case. KLUSON DELUXE "NO-LINE" for GIBSON LES PAUL JUNIOR etc, 1953-57. Rare complete set of original No-Line Klusons, with no model's name and no patent number, as produced from 1953 to late '56. All original and in good working order. It has some rust and the original buttons have shrunk, but are still solid and functional. No bushings. As used on many models, such as the early Les Paul Juniors. KLUSON DELUXE SINGLE-LINE/SINGLE-RING GOLD TUNER Very rare original tuner used by Gibson from 1957 to 1961 on models such as the Flying V, the ES 345 stereo, the ES 350T. PLEASE NOTE, not a complete set but only ONE single tuner, bass side. Original single-ring tulip button, plastic not shrunk, absolutely intact. Tuner cover has Kluson Deluxe stamped on a single vertical line and D-169400 patent number on the flip-side. KLUSON DELUXE SINGLE-LINE/SINGLE-RING GOLD TUNER Very rare original tuner used by Gibson from 1957 to 1961 on models such as the Flying V, the ES 345 stereo, the ES 350T. PLEASE NOTE, not a complete set but only ONE single tuner, bass side. Original single-ring tulip button, plastic has some sign of shrinkage but is very solid and functional. Tuner cover has Kluson Deluxe stamped on a single vertical line and D-169400 patent number on the flip-side. KLUSON DELUXE SINGLE-LINE/SINGLE-RING GOLD TUNER Very rare original tuner used by Gibson from 1957 to 1961 on models such as the Flying V, the ES 345 stereo, the ES 350T. PLEASE NOTE, not a complete set but only ONE single tuner, treble side. Original single-ring tulip button, plastic has some sign of shrinkage (heavier than the one shown above) but is still solid and functional. Tuner cover has Kluson Deluxe stamped on a single vertical line and D-169400 patent number on the flip-side. KLUSON DELUXE SINGLE-LINE/SINGLE-RING TUNERS Two very rare original tuner used by Gibson from 1957 to 1961 on models such as the Flying V, the ES 345 stereo, the ES 350T. PLEASE NOTE, not a complete set but only TWO single tuners, treble side. Original single-ring tulip buttons have shrunk and are completely lost, so they need to be replaced (excellent reproductions are available on the market). Gears work fine. Tuner covers have Kluson Deluxe stamped on a single vertical line and D-169400 patent number on the flip-side. KLUSON DELUXE "DOUBLE-LINE" TUNERS for FENDER, 1964-67. COMPLETE SET of original Kluson Deluxe tuners as used in the mid-sixties (64-67) Stratocasters, Telecasters, Jaguars, Jazzmasters. Patent # D-169400 on the flip-side, and "Kluson Deluxe" stamped on two separate lines on the cover. Complete with original bushings and screws!!! Still shiny, more than excellent condition. Sold as a SET only. KLUSON DELUXE "DOUBLE-LINE" TUNERS for FENDER, 1964-67. Another COMPLETE SET of original Kluson Deluxe tuners as used in the mid-sixties (64-67) Stratocasters, Telecasters, Jaguars, Jazzmasters. Patent # D-169400 on the flip-side, and "Kluson Deluxe" stamped on two separate lines on the cover. Complete with original bushings and screws!!! Excellent condition. Sold as a SET only. GROVER IMPERIAL Tuner SET, chrome, '50s-60s, for GRETSCH, GIBSON, D'ANGELICO etc . Very rare, complete and original set of Imperial tuners with 'stair-step' art-déco buttons. The Imperials were used on all the high-end archtops, both acoustic and electric. Fantastic look and perfect action. This very complete set includes the original box, all the 12 original screws and the six original bushings, which are made of two parts with a smaller bushing housed into a larger one, for perfect fitting to any size of hole. This set is completely different from later ones built in the mid-late 60s and in later decades. It still has the larger gear-housing, and each tuner can be easily dis-assembled to be used as right or left. The Imperial pictured on the box label, however, is of the later type and that makes me think of the second-half of the 60s as production and shipping date of this set, although the tuners are absolutely identical to '50s specs. Perfect conditions, really rare and gorgeous. GROVER IMPERIAL Tuner SET, chrome, '50s-60s, for GRETSCH, GIBSON, D'ANGELICO etc . Oh my, another one! All original set in perfect conditions! See the above listings for model's description and details. Everytime we find one of these we buy it right away... so nice, so rare. This one comes with the 6 original bushings and is just perfect. Sold as a set only. GROVER 'KIDNEY-BUTTONS' for GRETSCH, '60s, gold. We have SEVEN available, but please note that these are NOT COMPLETE TUNERS, but only buttons with sleeves, exactly the parts you see in the picture. Gold plating worn on six buttons, excellent on the other one, in good shape on the sleeves. We can sell them separately for € 12 each, or as a set for € 60. A rare and original Gretsch hardshell case from the Sixties, correct for many electric and acoustic deep-body archtop models such as 6120, Country Club, Streamliner, New Yorker, Single Anniversary & Double Anniversary, 1st version Tennessean, etc.Structurally, the case is in excellent condtions, with solid and fully working hinges, latches and handle. There is some wear on top, back and sides, and in a few spots and along the edges the wood shows through the torn grey covering. Inside, the lining shows some wear too and is ripped-off in the lower side. Nonetheless, it is a very beautiful, solid and functional case, which will protect your vintage Gretsch while greatly increasing its value. It will not fit thin-lines and 17" or wider models such as Country Gentleman and White Falcon. Dimentions (inside): max width cm 42 (16.5"), length cm 110 (43.3"), depth cm 10 (4"). FENDER STRATOCASTER SWITCH TIP, 1964. Original plastic tip for a '60s Stratocaster selector switch. What a nice find: a small batch of New Old Stock original "top-hat" switch tips for Fender Telecaster, Daka-Ware brand, never used. Absolutely perfect, n.o.s. condition. This model was used from 1956 through all the '60s until the '70s. It has the Daka-Ware brand with patent number. Four switch-tips available: we sell them 40 euros each, or 140 euros for the 4-piece batch. FENDER TELECASTER Daka-Ware "Top Hat" switch tips, 1956-'60s-'70s. FENDER KNOBS for JAGUAR, MUSTANG or JAZZ BASS, '60s original and in great conditions, complete with side-screws for fixing to the pot shaft. Sold as a pair only, NOT individually. GIBSON GOLD "REFLECTOR" KNOBS, 1959-1970, three single knobs sold individually. Two have "volume" in the silver insert on top, one has "tone". As you can see in the pictures, one of the two 'volumes' has a cracked edge, but is fully functional (the one on the left side in the pic). These knobs are a milestone in '60s Gibson hardware, used until 1967 on many models: ES 335, L-5 and Super 400 CES, ES 5 Switchmaster, ES 175, and many more, and until early 70s on Les Paul Deluxe... and were also used on many Epiphones. November 2007 update: only two left, please write for details. GRETSCH STRAP KNOBS, original '50s-'60s vintage Trhee original Gretsch strap knobs. Two (A-B) are gold plated, one (C) is chrome. The gold ones show some oxidation. Only two available, please call for details. HOLLYWOOD MEAZZI Logo, on a metal plate, for italian vintage guitars from the '60s. GIBSON PICKGUARD BRACKET for ARCHTOP, nickel. Original vintage bracket, complete with screw and threaded rod. Nickel plating makes it perfect for all the archtops built by Gibson before 1966. Please note: thinlines have smaller brackets, so this one is not correct for 335-style guitars. GIBSON Rosewood BRIDGES FOR ELECTRIC & ACOUSTIC ARCHTOPS, 1937-1952. It's the single-foot base model (not the later one with two feet) with the precompensated saddle, made of brazilian rosewood, both complete with brass hardware and in excellent conditions. Used from the mid-'30s to the early 50s on all the Gibson archtops (L-5, L-7, L-12, ES-300, ES-350, ES-5, ES-175, etc. etc.). ONLY ONE AVAILABLE. GIBSON ORIGINAL tune-o-matic BRIDGE FOR ARCHTOP GUITAR. Beautiful and original Gibson part, chrome with rosewood base. BIGSBY Pre-compensated BRIDGE aluminum. Original, it's the type often associated with Bigsby vibrato system, and often used by many US brands. Switchcraft three-way sselector switch complete with plastic tip. GRETSCH FILTERTRON PICKUP COVERS, gold. Perfect reproductions of the original FilterTron pickup covers, complete with patent number. Brand new condition, two available. In the picture you see them next to the original vintage parts. € 25 each. FENDER "Most Imitated Guitars Ad", Jaguar, Jazzmaster, Jazz Bass, Stratocaster, 1963, Rare original Fender ad, black and white, from a November '63 "Down Beat". One of the rarest and most sought-after Fender ads. The picture shows several pre-CBS models with all their features and patents shown on the right column. Original ad in excellent condition, not a reprint. In this section you'll find many of the finest guitars offered by Real Vintage in the past: each link leads to a page where you'll see the pictures of these great guitars. ALL the guitars you see in this section of the list are already SOLD, we keep them online only to provide an useful service to all the Vintage Guitar commnity, because there are thousands of detailed pictures you can use as a reference. Please note that you cannot use these on other websites, unless you ask our permission first.